The National Puppet Theatre is the only space in Cairo dedicated to children’s entertainment. Built by Nasser in 1959, it inaugurated its opening with the premiere of “El Leila El Kibeera,” an adorable marionette show about children walking through the festivities of a moulid. 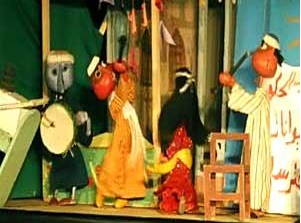 This puppet show has come to be one of Egypt’s most celebrated and recognized pop culture references along with Um Kalthoum and Abdel Halim Hafez. Even presidential candidate Abu Futouh used the music and imagery in a television campaign ad this year. Today, the theatre isn’t as famous or terribly accessible, as it is tucked beside the Ezbekiya Book Market and hundreds of squawking vendors, and its stage hasn’t really been updated much since its heyday. The performances rotate frequently, but are more children’s theatre with puppets (in addition to unbearably loud music and scratchy microphones) than traditional puppetry. There are master puppeteers and serious attempts to revive the art (check out Mohammed Fawazi‘s theatre here), but high quality shows are rare and difficult to hear about. But, it’s worth a visit–with or without a child–even once. Old marionettes are displayed in glass in the lobby, and, should the performance be cancelled, the grounds are a pleasant enough place to sip tea at twilight. And, I highly, highly, highly recommend trying to see “El Leila El Kibeera” anywhere if it is playing. It was the most wonderful live performance I’ve seen, quite possibly ever. Performances are generally Thursday and Friday evenings at 6 pm. Photo from El Shorouk.